OUR DOGS: both long-and shorthair,top champion lines.Chosen for their genetic soundness in: good markings,deep color,gentle temperament,intelligence and good moving. PUPPIES: the result of a planned program (which includes health and temperament controls over many generations) ,to produce,at reasonable prices,top quality,gentle,trainable pups. Full time attention;large enough to be very selective,and ensure quality. 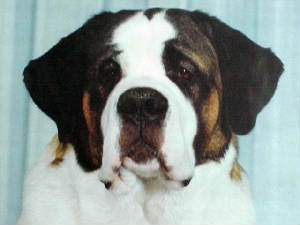 With the help of experienced breeders such as the Pederson's and Seaman's we learned about checking pedigree's with breedings,evaluating dogs,showing,etc. To learn more,we attended College classes dealing with genetics, skeletal structure, movement, and general canine health and breeding practices. In order to infuse new blood into our stock, we have often brought in males with good bloodlines from established kennels throughout the world, including here in Canada, the USA, Switzerland and the Netherlands. Pups and dogs from here have gone to France, Greece, England, Denmark, Mexico, Argentina, Italy, Bolivia, Holland, Portugal, Scotland, and all over Canada and the US. We have received "Top Saint Breeder in Canada Award";also were awarded Life Membership in the Canadian Kennel Club. The photo pages give a little bit a view of our kennel over the years. Many of these dogs were from the past,others on photo's are still here but getting older,10 years old or over; they stay till the end. We are trying to cut down to a smaller operation,but still keep some very good,top quality younger Saints for the present and near future. Thank you for visiting here on the web with us.For more information,or questions,you are very welcome to contact us,by clicking on our email address above,or by phone.------ For some new photo's,new pups etc.please see photo's last photo page. 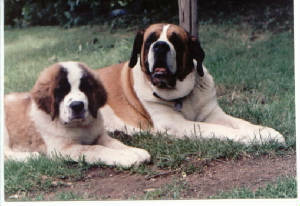 Click here to view more photos of our dogs through the years and photos/news regarding puppies.